... until The Bedford Golf Club came along and built its 18 hole golf course on part of the Biddenham Loop. The development also included a small number of detached houses known as the golf village - a fair amount of this housing is actually set within the golf course itself and the roads are named after the famous golf courses such as Carnoustie, St. Mellion, and Prestwick. The Loop has now been renamed Great Denham, and despite trawling the internet for information I cannot find the exact reason for this name being used. I can see that the word Denham could have been extracted from Biddenham and the Great may have been borrowed from the adjacent river and added to distinguish itself from the historic village of Denham in Buckinghamshire. I'm going with that possibility for now, but if I manage to find any further information, I'll update this post. Great Denham was initially part of the Biddenham parish, but became a village and parish in its own right in April 2007. 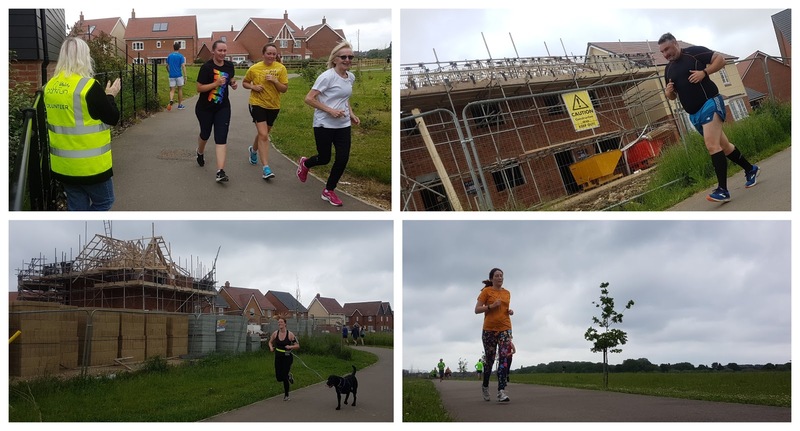 The continued development of the land includes in excess of a thousand new homes, a school, shops, doctor's surgery, a community hall and a sports pavilion complete with a series of pitches. During an archeological dig before the developments took place, archaeologists discovered the remains of a 5000 year old archer complete with an almost perfectly preserved ceramic striking plate. 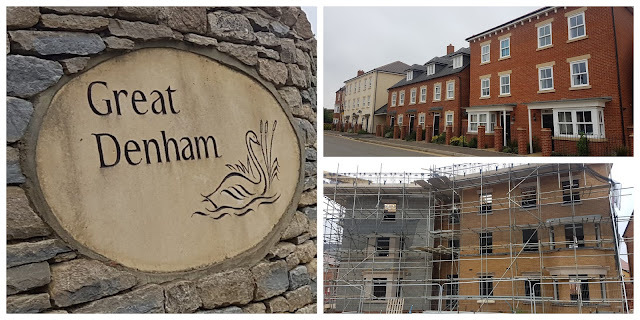 The reason I had visited Great Denham was to visit the brand new Great Denham Country Park which like the rest of the village still has elements which are under construction. The country park covers an area of 150 acres in the south east corner of the loop. It features open meadows as well as lakes and ponds, all designed to encourage biodiversity. So far the only completed amenities are the two playgrounds. A sports pavilion containing a cafe and toilets, and an onsite car park will follow in due course, so it is very much a work-in-progress. 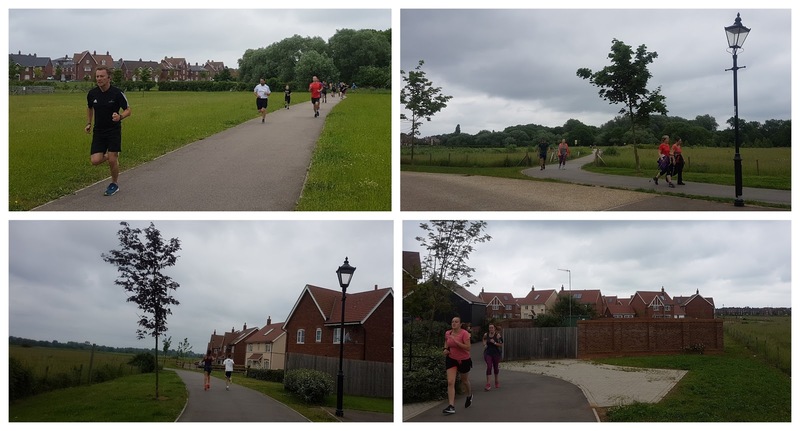 However, it does already have another fully-functioning feature and that is a free, weekly, timed 5km event called Great Denham parkrun. I drove over to Great Denham on the first weekend in June 2018 and followed the parking instructions on Great Denham parkrun's course page, which meant I left the car in the Park and Ride car park just off Kingswood Way and jogged the remaining 800m or so over to the country park. There has been some conflict around parking as some people have not been following the instructions and have instead been parking on King Alfred Way - this has been causing problems for locals, so it is important that the instructions are adhered to. For anyone travelling by public transport, you'll find the nearest train station is in the centre of Bedford approximately 2 miles away - not bad for a warm-up jog, or if you don't fancy doing it on foot, buses 8, 11 and 24 will get you into Great Denham. At present there are no bespoke cycle racks in the country park, but I imagine there will be when the facilities are finished. As I mentioned before, the toilets haven't been built yet, so I stopped off at a service station in Marston Moretaine, just 10 minutes outside Great Denham, to use their facilities. The meeting point for the parkrun is right next to the large playground in the grass amphitheatre. As far as the course goes, this is a flat, anti-clockwise, two-lapper with a combination of a compact sand/gravel and tarmac paths underfoot. Road shoes are the order of the day and the course is perfectly fine for a spot of buggy running. From the start the participants head south along the perfectly straight sandy/gravelly path for 200 metres until reaching the first corner which features quite a sharp left-hand turn. The course now heads generally to the north with the open meadows of the country park on the left and a line of trees which form the boundary of the park on their right. This path is also part of the Ouse Valley Way, a 229 kilometre (142 miles) walking route between Syresham in Northamptonshire to Kings Lynn (my blog) in Norfolk. Towards the end of the path, those with a keen eye may spot the river through the trees. 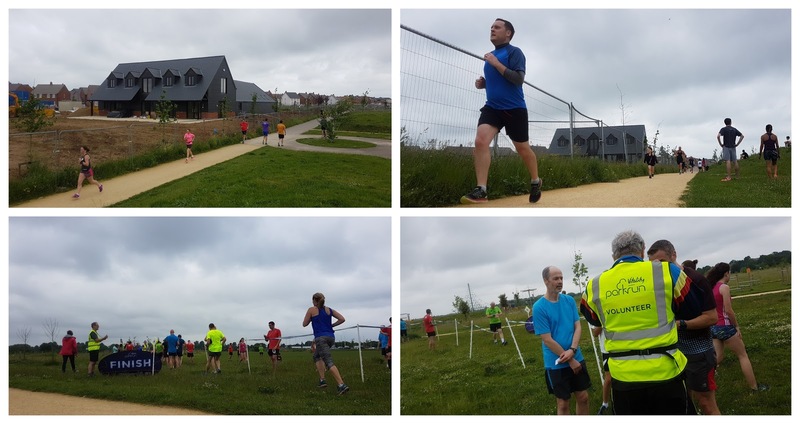 At the northern tip of the course, the route leaves the Ouse Valley Way and cuts through the centre of the park via a tarmac path before meandering along its northern border which eventually returns the participants to the playground and the long straight path where lap two begins. At the end of lap two the finishing funnel along with a great team of volunteers will be set up on the grass. Barcode scanning takes place right next to the finish line and it's now time for a well-earned rest while cheering in the rest of the crowd, of course. I recorded the run with the Strava app on my phone (I forgot my Garmin) and uploaded the course. I also used this data to make a relive course flyby video. The results were processed and available online shortly after the run and I see that event 14 attracted 195 participants which was a little higher than the current average - this may have been due to Milton Keynes parkrun (my blog) being cancelled. At the moment the team head over to The Eatery for the post-run social, but I imagine the onsite cafe will replace this venue once it is open. This is another fab parkrun venue, and along with Bedford parkrun (my blog), gives the residents of the Bedford area a second flat and fast option for local parkrunning. A huge thanks to the team of volunteers that made/make it all possible.